When people picture the life of a Southern Californian, they picture us all hanging out by pools, sipping a cocktail, and enjoying the sun! For those of us who live here, we know that’s not always the case. Many of us don’t have pools or access to pools unless staying at a hotel on vacation! 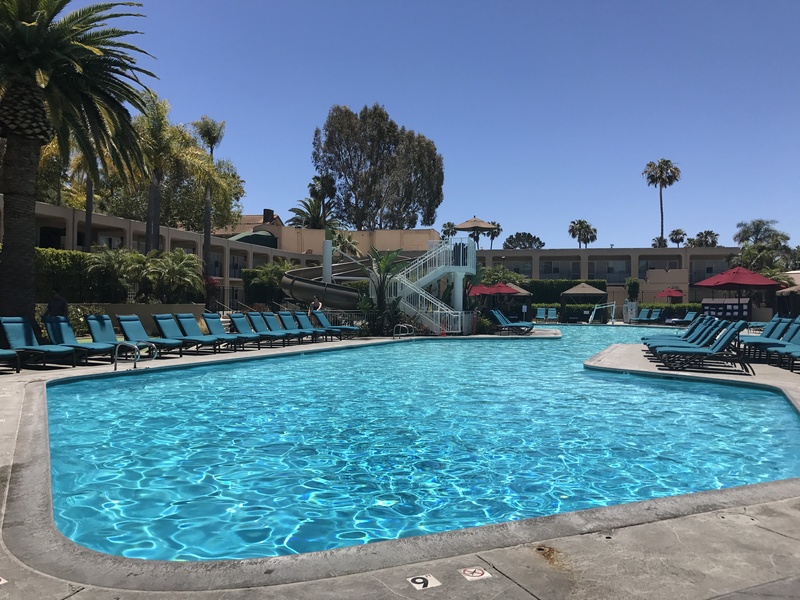 The perfect solution would be able to affordably lounge by pools at the amazing hotels in Los Angeles, Orange County, Palm Springs, San Francisco, and San Diego, for an easy way to relax on the weekend or have a daycation. Fortunately, I recently tried out this service called DayAxe, which allows you to do just that! DayAxe.com is a site where you can purchase hotel day access to many upscale hotels, such as The Ritz Carlton Los Angeles, The Beverly Hilton, Hilton La Jolla, Riviera Palm Springs, and the hotel I went to, Hyatt Regency in Newport Beach (these are just a handful of the hotels they offer on DayAxe). With a day pass, you have access to the beautiful pools at these hotels, as well as a discount on food and drink, and can get other services such as spa access and cabanas. Prices start at just $15 for a day pass! My husband and I are Orange County locals, so we chose to get two day passes to the Hyatt Regency in Newport Beach. The hotel had three pools, one for families and two for just adults. Each pool has a different vibe, but are all equally gorgeous. We took advantage of our discount on food and drink, and ordered poolside cocktails and lunch. They have a service at this hotel where you can call a number for poolside service and have items brought to you from the restaurant and bar. We lounged in the huge lounge couches around the pool, and spent our afternoon sipping on drinks, going in the Jacuzzi, and in the pool for a relaxing dip. When you’re done lounging by the pool, the hotel’s lobby has an amazing lounge area with art and decor books you can explore for some quiet time. Or, you can head to the restaurant for a sit down dinner at a discount with your DayAxe pass. The staff were all very friendly and attentive, making this trip we took for our anniversary a huge win! DayAxe passes, ranging from $15-$40, are already an amazing deal for a day of luxurious poolside fun! But to get an even more amazing deal off your first purchase you can use code JESSM20 for 20% off your order of a DayAxe hotel day access pass at DayAxe.com! Happy lounging!